Description of "How to make extra money for that rainy day (eBook)"
Buying this book is an 'investment' rather than 'expenditure', because it will change the way you think about money and asset generation! A versatile writer who reveals eye-opening truths to the world.. things that you would not learn at schools or colleges, and no one would teach you in life! 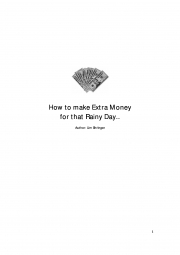 Reviews of "How to make extra money for that rainy day (eBook)"